Pritchett, who was also the No. 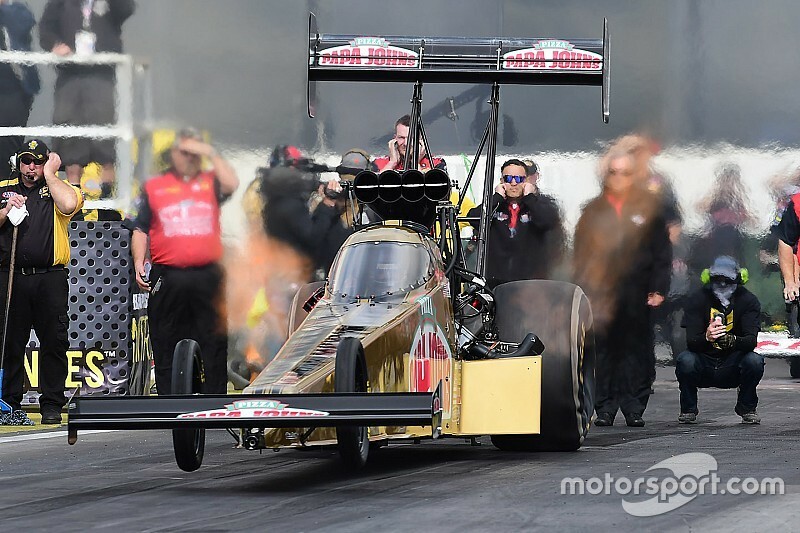 1 qualifier of the event held at Auto Club Raceway at Pomona, piloted her Papa John’s Pizza dragster to a 3.711-second pass at 324.98 mph to defeat Doug Kalitta who smoked the tires of the Mac Tools dragster’s at the start. 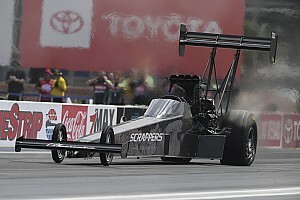 Pritchett defeated Steve Torrence and eight-time champion Tony Schumacher en route to the finals. Kalitta, who was in his third consecutive final at Pomona, took down Terry McMillen and reigning champion Antron Brown. Hagan raced to his 23rd Funny Car victory with a 3.875 at 330.07 in his Mopar Express Lane Dodge Charger R/T, narrowly defeating Courtney Force’s Auto Parts Chevrolet Camaro, which ran a 3.901 at 326.95. It was Hagan’s second Winternationals win. “It’s a real special race for me,” said Hagan for whom this was a second Winternationals win. “A lot of stuff happened over the off season, with losing my brother. We came out motivated. Hagan’s victorious run began with defeats of teammates Jack Beckman and Ron Capps, the defending world champion. 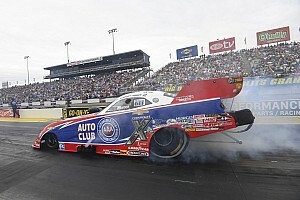 Force beat J.R. Todd, who was racing in his first event in a Funny Car, and father and team owner John Force. Reigning champion Line started his title defense with a victory over teammate Greg Anderson. In another stunningly close final shootout, Line’s Chevrolet Camaro ran a 6.568sec at 211.10mph compared with Anderson’s similar car and similar time – 6.579 at 211.56. TOP FUEL: 1. Leah Pritchett; 2. Doug Kalitta; 3. Antron Brown; 4. Tony Schumacher; 5. Troy Coughlin Jr.; 6. Steve Torrence; 7. Terry McMillen; 8. Brittany Force; 9. Shawn Reed; 10. Scott Palmer; 11. Clay Millican; 12. Steve Faria; 13. Terry Haddock; 14. Troy Buff; 15. Steven Chrisman. FUNNY CAR: 1. Matt Hagan; 2. Courtney Force; 3. John Force; 4. Ron Capps; 5. Jack Beckman; 6. J.R. Todd; 7. Tommy Johnson Jr.; 8. Del Worsham; 9. Alexis DeJoria; 10. Robert Hight; 11. Tim Wilkerson; 12. Bob Bode; 13. Phil Burkart; 14. Jeff Diehl; 15. Cruz Pedregon; 16. Jim Campbell. PRO STOCK: 1. Jason Line; 2. Greg Anderson; 3. Bo Butner; 4. Erica Enders; 5. Shane Gray; 6. Jeg Coughlin; 7. Tanner Gray; 8. Vincent Nobile; 9. Drew Skillman; 10. Chris McGaha; 11. Matt Hartford; 12. Alan Prusiensky; 13. Kenny Delco; 14. Deric Kramer; 15. Allen Johnson; 16. Val Smeland. TOP FUEL: 1. Leah Pritchett, 122; 2. Doug Kalitta, 105; 3. Antron Brown, 79; 4. Tony Schumacher, 70; 5. Brittany Force, 57; 6. Troy Coughlin Jr., 54; 7. Steve Torrence, 53; 8. Terry McMillen, 48; 9. (tie) Scott Palmer, 32; Shawn Reed, 32. FUNNY CAR: 1. Matt Hagan, 119; 2. Courtney Force, 99; 3. John Force, 80; 4. Ron Capps, 77; 5. Jack Beckman, 53; 6. (tie) Tommy Johnson Jr., 52; J.R. Todd, 52; Del Worsham, 52; 9. Robert Hight, 36; 10. Alexis DeJoria, 35. PRO STOCK: 1. Jason Line, 126; 2. Greg Anderson, 103; 3. Bo Butner, 77; 4. Erica Enders, 75; 5. Vincent Nobile, 58; 6. (tie) Jeg Coughlin, 56; Shane Gray, 56; 8. Tanner Gray, 52; 9. Chris McGaha, 33; 10. (tie) Matt Hartford, 32; Deric Kramer, 32; Drew Skillman, 32.